The incident happened on the route between junction 8 near Canderside and junction 9 at Draffan. Commuters are facing major delays on the M74 after a fuel spillage. The incident happened on the busy southbound route between junction 8 near Canderside and junction 9 at Draffan at around 8.05am on Wednesday. A two-vehicle crash also occurred in the same area shortly after 7am as two cars reportedly careered off the road. Officers were called to scene and cordoned off the southbound lanes as a result. Traffic Scotland tweeted: "08:05 #M74 is CLOSED from J8 Canderside - J9 Draffan due to a spillage and RTC. 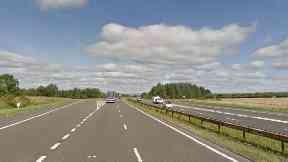 The main carriageway on the M74 has since been reopened but the exit-slip road remains closed. Traffic Scotland said: "08:36 M74 S/B main carriageway now OPEN J8 Canderside - J9 Draffan, J9 exit-slip is now CLOSED due to a spillage and earlier RTC."